With the Queen Elizabeth’s official 90th birthday coming up this weekend, what better way to celebrate than with the best of British? A stylish and fun outdoor brunch will be taking place on Saturday at the idyllic Spa Fields in Clerkenwell. Hosted by London party experts Bourne & Hollingsworth, you can expect plenty of the great food, entertainment and cocktails they are famous for. Essentially a mini festival to mark Her Majesty’s big day, guests will be able to drink and eat aplenty, while being entertained by live music and performances. The menu has been designed by executive chef Adam Grey, from the nearby Bourne & Hollingsworth Buildings, featuring tasty, locally sourced produce. There will be several sittings during the day so you can relax in the sunshine and feast on some of your favourite brunch offerings. Meanwhile, the B&H mixologists will be at the open-air bar, creating morning cocktails to ease you into the day, such as Bloody Marys and Bellinis. After your meal, you’ll be able to burn off some calories taking part in the traditional British games. Her Majesty’s Brunch takes place on Saturday 11 June 2016. At Spa Fields Park, Northampton Road, Clerkenwell, EC1R 1AA. Nearest station: Farringdon or Angel. From 10am-8pm, with brunch sittings taking place from 12:30pm. £35 for entry and brunch. For booking, visit the Bourne & Hollingsworth website. The red telephone box is one of Britain’s biggest icons – it’s up there with red London bus, Big Ben, Beefeaters, the Union Jack and Queen Elizabeth II herself. But for tourists arriving in London ahead of the Olympics, may find themselves slightly confused by the bizarre-looking phoneboxes dotted around the capital. However, these multi-coloured and embellished street furniture haven’t been vandalised, they are simply part of the BT ArtBox project to mark the 25th anniversary of children’s charity Childline. They have invited artists and companies to customise their own replica box, which have been displayed around the city. But don’t get too carried away, these boxes don’t include a working phone should you need one, they’re simply for your viewing pleasure. With the use of telephone boxes on the rapid decline since the popularity of mobile phones, I think the ArtBox project is an ingenious way to celebrate this iconic structure that draws so many tourists to pose inside them, as well as raise awareness and money for Childline. Following their display around the streets of London, they are to be auctioned off. Before we find out about some of the Artboxes I have come across, a quick history about the real things. The first public telephone box was designed in 1920 for the Post Office and named K1 (Kiosk No.1), based on the same idea as the Police Telephone Boxes and Posts. However, the London Metropolitan Boroughs weren’t too impressed with the design and so the Fine Arts Commission judged a competition to find a more attractive and practical design. The winner was a London-born architect named Giles Gilbert Scott (who later designed Battersea Power Station) who came up with a classical style with a dome on top – inspired by Sir John Soane’s mausoleums at St Pancras Old Churchyard and Dulwich Picture Gallery (read my blog on the current Andy Warhol exhibition here). So with the K2 design chosen, the Post Office chose to make it red so it easily to stand out to the public searching the streets for a payphone. Various different models followed, the K3, K4 and K5, but it is the K6 one which is most famous today. Sir Giles designed the K6 model in 1935 to commemorate the Silver Jubilee of King George V. The model was rolled out across the country with the amount of public phone boxes in Britain rising from 8,000 in 1930 to 19,000 in Silver Jubilee year, rising even further to 35,000 by the time World War II broke out. Today, with a majority of the boxes owned by BT and a lot less attractive, modern phone boxes instead and the widespread use of mobile phones, you will find the red telephone boxes aren’t in such demand as they used to be. The days of queuing for a phone box and huffing and puffing when you’re stuck in a line behind a right chatterbox appear to be long gone. Many tourists are likely to come across the two on a traffic island in Trafalgar Square – Mandii Pope’s ‘Big Ben’ and Lauren O’Farrell’s ‘Dial M For Monster’. A short hop away outside Charing Cross Station on The Strand is Fred Butler’s Mobile Phone, designed to look like a vintage mobile. With actual buttons, it creates nostalgia for a design already outdated by Smartphones. Another popular tourist spot where the public will come across the ArtBoxes is in Potter’s Field Park – the green expanse outside City Hall on the south bank of the River Thames. Right beside the base of Tower Bridge is London & Partner’s ‘Welcome To London’ box, a white box covered in speech bubbles with different languages to represent the multi-cultural melting pot that is London. Less than a minute’s walk to the East of City Hall are two ArtBoxes – Aboud & Aboud’s ‘Shocking Conversation’, which looks like an unfinished box which has been partially dunked in red paint. It has been described as the colour is ‘draining out’ of the box. Next to it stands Peter Anderson’s ‘London Calling’, which features iconic images of Joe Strummer and The Clash from the 1980s. While most of the ArtBoxes are in and around the City and West End, some are dotted a bit further out, including Westfield Stratford, Canary Wharf and Ravenscourt Park. Just outside the West End are two located in and outside the Royal Albert Hall. The ArtBox outside, entitled ‘Ring-A-Royal Phonebox’ created by children’s TV presenter Timmy Mallett, has a royal theme, which is very apt considering the origins of the concert venue and the fact the Duke and Duchess of Cambridge live a short walk away in Kensington Palace. Each side of the box contains some of the most popular members of the Royal Family – the Queen herself, the Duchess of Cambridge and Prince Harry. Kate Middleton is recognisable with her glossy brown hair and blue dress and is pushing a pram – significant to the pressure she is under to produce a royal heir. The Queen is accompanied by one of her beloved Corgis, while Harry is pulling Usain Bolt’s classic pointing pose – so the ArtBox is both celebrating the Royal Jubilee, while making a nod to the Olympics. Or to read about his grandfather Sir George Gilbert Scott’s creations, click A bit of bling amongst the green: The glistening Albert Memorial in Hyde Park or inside the St Pancras Renaissance Hotel: Afternoon tea at The Gilbert Scott review: Treat yourself in stunning Gothic surroundings. So yes… the weather isn’t going to be as good as we hoped this Jubilee Bank Holiday Weekend. But London is a city of all weathers and we’ll be on the world’s stage again this weekend when we celebrate Queen Elizabeth’s Diamond Jubilee. As we’re back in a recession… again… what better way to forget Europe’s economic doom and groom and celebrate what’s good about Britain – and goodness knows, spending a few quid on some bunting or a bottle of Pimms will help the economy. I’ve never had a strong opinion for or against the Royal Family, but I appreciate their value to our tourism industry. I remember how their image plummeted following the death of Princess Diana in 1997 and now 15 years later, they seem to be riding a new wave of popularity, helped in spades by Prince William and his glossy-haired bride Catherine. Over 1,000 boats will sail down the Thames, starting from Battersea Bridge around 2pm and ending at Tower Bridge at 6pm. The Queen herself be on the royal barge, the Spirit of Chartwell, embarking near Albert Bridge. The flotilla will cover seven miles of river, with large viewing screens dispersed along the river banks so everyone can see. Police are recommending spectators arrive no later than 2pm. For more information and maps to print off visit the official Thames Jubilee Pageant website. For those with young children, somewhere not involving packed crowds standing in close proximity fighting for a glimpse of the royals is probably a good idea. Sainsbury’s has organised a two-day festival in Hyde Park, including live music and entertainment from Britain and across the Commonwealth. Celebrities including Myleene Klass, Jon Culshaw, Kara Tointon and Strictly dancers will be taking part. Although many tickets have already been sold, there will be limited tickets on the gate, which opens at 10:30am and closes at 7pm. Visit the Jubilee Family Festival website for more information. Free street party on Bellenden Street in Peckham where the road’s boutiques, art galleries, shops, cafes and pubs will be opening their doors with lots of events. The road is closed off to cars with tables in the middle for eating and drinking. Visit the Facebook page for more information. Piccadilly will be closed off to vehicle traffic for the first time its history with some of the road’s most famous establishments hosting various events. BAFTA will be giving people the chance to walk the red carpet, The Cavendish London will be making a hog roast, The Ritz’s resident band will be playing, and loads more food and entertainment. Visit the Big Jubilee Lunch website for more information. There’s nothing like an East End knees-up. The Water Poet near Liverpool Street is hosting a street party with food, drinks and dancing. In the evening there will be a live screening of the Jubilee concert at Buckingham Palace. Visit the Water Poet’s website for more information. At around 2:20pm, the Queen and the royal family will ride in a formal carriage procession from the Palace Of Westminster to Buckingham Palace following a service of thanksgiving at St Paul’s Cathedral and lunch earlier. They will travel along Whitehall and The Mall, before gathering on the balcony of Buckingham Palace at around 3:30pm. The Royal Family’s appearance on the balcony will culminate with a RAF flypast and a gun salute. A party in the grounds of the 19th century gallery with canapes and sparkling wine. There will be short tours by the curator and a performance of Fifties songs by soprano Alexandra Carter. Tickets £18. Visit the Dulwich Picture Gallery’s website for more information. It may be the Queen’s weekend, but one of the best things about London is our multi-cultural residents and cuisines from around the world. Market stalls with different world cuisines will be set up in Southbank Centre Square on London’s Southbank. Visit the World Street Food Festival’s website. Whatever you do, enjoy the weekend and don’t forget to check the TFL website. There’s going to be some road and tube station closure so be prepared. 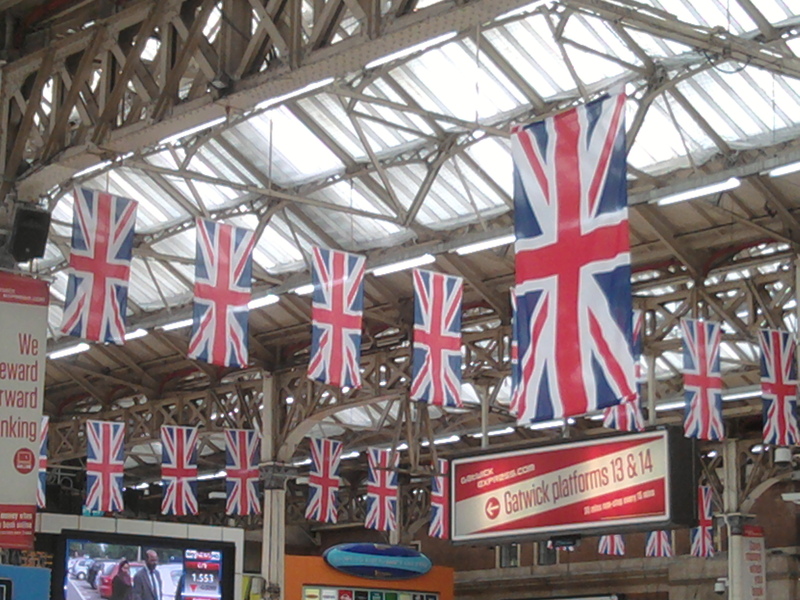 Happy Jubilee Weekend!